Our production capabilities know no bounds, and every client will require a different editorial push, or branded content function. Any other ideas that come to mind. Let’s try and shake things up together. Brief: To amplify Accenture's position as a key and innovative thought leader in the media, marketing and martech space via an integrated four-month content program across AdNews' full suite of channels. Execution: Four single page features in print; three features re-purposed for online coverage; regular inclusion in AdNews daily newsletter; four video interviews with senior Accenture executives led by AdNews editor (see links below); podcast featuring two Accenture executives; full campaign backing with social push across all channels. Brief: Today, consumers know more about the products, services and brands that interest them than ever before, which makes culture more important to building brands than category. How does AdNews partner with Carat to explore the big shift from category to culture? Execution: 20 leading Aussie marketers invited to an intimate, exclusive breakfast roundtable. Discussion was filmed for an edited video that was distributed on AdNews and AdNews’ YouTube channel. Backed by double page feature in print; two content pieces online and a social push across all channels. Brief: To amplify Carsales' position as the nation's premier portal for automotive buying, selling and market intelligence via a compelling, integrated content program across AdNews' full suite of channels. The content program had to be a 'must consume' to anyone involved in the automotive sector. Execution: Four-page 'State of the Motor Market' comprehensive print report; six online stories (example) published over a two to four-week period and distributed via daily newsletter and social. Backed by a strong display campaign: two full page brand advertisements in consecutive issues of AdNews; four weeks of online display, MRECs and banners across run of site; four weeks MRECs on the AdNews daily newsletter. Brief: Tribes are emerging and growing at pace. People are feeling the need to share and connect in a more authentic way, with people who share genuine passions, values or interests. From a marketer’ s perspective, tapping into this tribal behaviour and building teams of advocates is essential for brands. But how can brands find and embrace their tribe? Execution: AdNews devised, produced and hosted an invite-only roundtable discussion with several leading Australian marketers. Over a two-hour breakfast, we sparked the conversation – driven by AdNews editor Pippa Chambers – and recorded the outcomes for video, and for a double page feature in print that was later disseminated online. For more information about 1928 Content, check out this handy PDF, or get in touch with associate publisher Nicola Riches and national head of sales Paul Carroll. AdNews launched in 1928 and we’re delighted to be celebrating our 90th anniversary this year. Our founding year is the inspiration for an entirely new division, launched today, and dedicated to the explosion of branded content that we have witnessed. 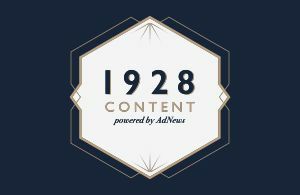 While we have been devising, creating and shaping branded content for our partners over the past two years, it's only now that we are launching the division under the fitting moniker: '1928 Content'. You know as well as us the power of an exemplary content campaign, but what you might not have known about AdNews, until now, is that we have been in the business of creating content for 90 years. That gives us a pretty strong head start, doesn’t it? We also have two other distinct advantages. Firstly, we understand your business, what it is you’re trying to achieve and the wider landscape you’re operating in – that’s our bread and butter; day-in, day-out. Our second advantage is our readership: 170,000 average monthly unique online readers, 19,000 newsletter subscribers, 5,000 print subscribers, 16,000 Facebook followers, 8,500 LinkedIn followers, and 40,600 on Twitter – for the most part (OK, maybe not the whole Twitter army) they are loyal, engaged and smart. You probably know who our readership is: they are your colleagues, clients, rivals, or more pertinently, your future customers. Distributing content through our channels is an endorsed introduction to that client of the future. Let us show you what 90 years’ experience looks like. Welcome to 1928 Content.